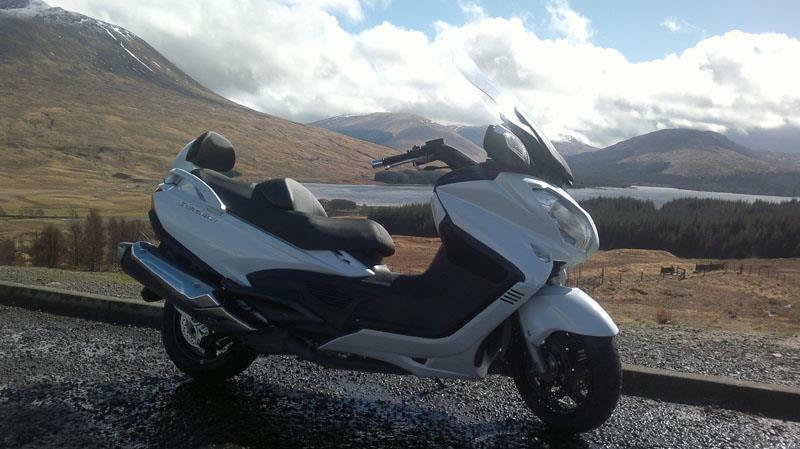 MCN is on the launch of Suzuki's new Burgman 650 ABS Executive at Glen Coe in Scotland. The luxury maxi scooter has undergone the biggest changes since its introduction a decade ago. The engine is the same 638cc parallel twin but tweaks have made it 15% more fuel efficient according to Suzuki. The frame has been changed to give a steeper steering angle, aiming for greater agility. New bodywork has given the Burgman a more aggressive look than its ever-so conservative predecessor. Six litres of under-seat storage has been sacrificed to slim down the rear end, still leaving an impressive 5O litres. The instrument panel is new, with side-by-side analogue speedo and rev counter instead of the old digital display. Suzuki says the scooter is now easier to push because 'transmission drag' has been reduced by 35%. Standard equipment includes heated grips and seat, electronically adjustable screen and mirrors that fold back at the push of a button. Like the old Burgman, the scooter has two twist-and-go modes, Drive and Power. There's also a six-speed semi-automatic mode using buttons on the left bar to change up and down with no clutch. The new Burgman costs £8932 OTR, £624 more than the old one but still £863 less than BMW's C650 GT, and that comes without a heated seat and grips. Just calling the Burgman a scooter doesn't seem to do it justice. I'm struggling to think of a machine I'd rather be riding on the damp roads of Glencoe. In Power mode there's plenty of go for overtaking on fast A-roads. Drive seems sedate in comparison. The handling feels sporty for a maxi-scooter, although the steering can seem a tad flighty as the speedometer needle climbs. There's still space for two-full face helmets under the seat and the styling has definitely benefited from the reworking. The silver colour option has changed from metallic to matt. The other choices are white or black. A persistent complaint from journalists is that the heated grips aren't as warm as they should be. Read the full report in MCN soon.